1. Quality Management System complies with ISO 9001. 2. Machine passed CE International Certification. 3. More polishing heads & faster swing speed of crossbeams will make the slabs with higher polishing gloss & efficiency. 4. 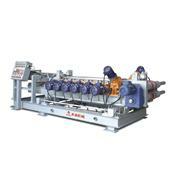 Use special design air pressure system, save abrasive, reduce loss and work more efficiently. 5. Use finish machining fittings & import components on machine, to lower malfunction & extend lifespan. Company Address :No.265, Songjiagang Road, Zhoushi Town, Kunshan City, Jiangsu Province China 215337.